Are you looking for something different for your corporate party, or do you need a fabulous live band for the ultimate Florida beach wedding? Look no further than the premier steel drum band in the state, RythmTrail! We play the best soca, the top calypso, rocking reggae and fantastic steel drum music whenever and wherever you need us most. Reach RythmTrail today with a click of your mouse or phone call and our native Caribbean island steel drum players will provide you with a free quote right now. With over 20 years of steel drum music experience, you can bet your party will be remembered for years to come. Whether we bring our whole steel drum band to play or you hire just one of us for a solo performance, you can be sure that RythmTrail will make your beach wedding, corporate event or house party the perfect day or night. 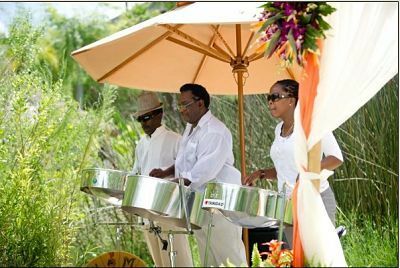 Book RythmTrail today and turn your party into a tropical island adventure with the soothing sounds of RythmTrail steel drum band. RythmTrail offers great steel drum music throughout the state of Florida, as well as nationwide and internationally. From the best ceremony music for your Florida Beach wedding to a creative and successful corporate gathering, RythmTrail can play all of your favorite melodies—anywhere and everywhere. You can even create your own favorite playlist of songs or let RythmTrail do the work for you and turn your gathering into a romantic, rocking or dancing party that will set the mood for your special day. Call RythmTrail right now at 866-495-4522 or get your free quote online and take your next event to a tropical island paradise. We hired RythmTrail Steel Drum Band for the cocktail hour for our wedding and we were extremely pleased. Ephraim was extremely professional and responded back to all our inquiries very quickly. He did an awesome job at our wedding and his music set the mood for a fun and relaxing evening which is exactly what we wanted. We did get a lot of complements from our guests for the beautiful music of the steel pan drums! I would highly recommend RythmTrail Band! Thanks again Ephraim! Even though I didn't get to hear you at our wedding, so many of our guests took videos and I was very happy to see people enjoying your music. We really loved having you - you did an awesome job and made the wedding! "Ephraim performed on Steel Drums for our wedding ceremony and cocktail hour, and then switched to DJ'ing for our reception. He did an amazing job! His steel drum performance made the wedding and really set an island tone. He was very professional and worked with me (the bride) to know exactly what I was looking for at my wedding. He called prior to the event, making sure nothing had changed. He made sure all the guests had a great time - I would highly recommend RythmTrail Steel Drum Band for your event!"